Fall of the Mughal Empire according to Dr Kalika Ranjan Qanungo, "is a history of a higher order than the History of Aurangzib, which is but a biography writ large with an ample background. Jadunath Sarkar gains more in ease, humour and eloquence, shows a greater mastery over historical narrative, and a higher literary workmanship, keeping a wonderful balance between synthesis and analysis by handling the telescope and microscope of history in his Fall of the Mughal Empire." Moreover, it "has a wider appeal to the people of India, and also of Europe than his History of Aurangzib , each volume of which imparts fine shades of colour to the picturesque carpet of the evening twilight of our Mediaeval history." Consequently, it is all the more interesting and worthwhile to know more fully about it. After publishing the first editions of the first four volumes of his monumental work History of Aurangzib by November 1919, Jadunath Sarkar took up the! work of duly editing and preparing the press copy of William Irvine's eminent work Later Mughals, which had remained a fragment due to its author's untimely demise on 3rd November 1911. William Irvine had helped Jadunath Sarkar greatly since his first acquaintance with him in 1902, as the reviewer of his first and really noteworthy work India of Aurangzib, which unfortunately has not yet been reprinted . According to P.E. Roberts, William Irvine's Later Mughals, edited and brought down to AD 1739 by Jadunath Sarkar, "drives a broad pathway through a very tangled jungle .... Itis a piece of work which badly needed doing, and it has been done with amazing thoroughness .... The most notable part of the book is the careful incorporation of Persian and Marathi unpublished material." Hence after completing the fifth volume of his History of Aurangzib, dealing with "The Last Phase, 1705-1707" of Aurangzib's reign on 14th December 1924, Jadunath Sarkar spent much time in collecting original source materials for his further studies about the fall of the Mughal empire. His visit to Jaipur proved very fruitful in discovering important records for the years 1712-60, many of which were copied out for him in eighteen volumes, now known as Sarkar's Collection from the Jaipur records. He also initiated the examination of Persian and Marathi records, written in Modi script, at the Alienation Office, Poona. He thoroughly rewrote and greatly enlarged his Shivaji and His Times (third edition, 1929) and later revised and rewrote his fourth volume of History of Aurangzib (second edition, 1930). Only thereafter could he take up the writing of the first volume of his Fall of the Mughal Empire which really took much time in its actual composition, because of the great attention he paid to his style while-writing it. When Jadunath Sarkar took up the writing of his Fall of the Mughal Empire, there were only a few English books on the subject, such as H.G. Keene's Fall of the Moghul Empire (revised edition, 1872) and Sydney J. Owen's Fall of the Mogal Empire (1912), which were much more detailed than the relevant chapters in Elphinstone's History of India (first published in 1841). But they were all mainly based on some eighteenth century Persian works, like that of Khafi Khan's Muntakhabul- Lubab or Gulam Husain's Siyar-ul-Mutakherin and J. Grant Duff's A History of the Mahrattas (1826). Again, during the last quarter of the nineteenth century a number of eminent researchers in Maharashtra such as V.K. Rajwade, K. N. Sane, V.V. Khare and D.B. Parasnis had begun to collect and published volumes of original Marathi source materials of Maratha history, but the same were yet to be duly utilised after a careful study and a critical scrutiny. Fall of the Mughal Empire is in fact a continuation of William Irvine's Later Mughals, which carried the history of the Delhi empire upto May 1739 when Nadir Shah left Delhi on his way back to Persia via Kabul. Thereby Jadunath Sarkar took up the task of completing the original project of William Irvine to write the history of the later Mughals upto the capture of Delhi by the English in 1803. Consequently, he took up the writing of his monumental work Fall of the Mughal Empire, and completed it in about twenty years, its last and fourth volume being published in 1950. It was really a very happy coincidence that the preparations for writing the Fall of the Mughal Empire coincided with the epoch-making task of the exploration, selection and publication of all volumes of not only the Selections from the Peshwa Daftar but also of the Poona Residency Correspondence series. Thus Jadunath Sarkar was able to duly utilise relevant information and details contained in the various volumes of the Selections from the Peshwa Daftar, the Poona Residency Correspondence series and other additional original source materials, including the Gulgule Daftar of Kota which had been brought to light while he was writing relevant volumes of this colossal work. Jadunath Sarkar as a historian was not an accident", according to his lifelong colleague the Maratha historian, Govind Sakharam Sardesai, "not a fortunate child of opportunities, but a consummation of a life of preparation, planning, hard industry and ascetic devotion to a great mission. "* Moreover, Jadunath Sarkar's astounding success and noteworthy achievements as a historian are due not only because of his correct and healthy concept of history, but all the more so due to his having adopted the latest and proper methods of historical research. He is well known for his systematic methods of research, painstaking care for the minutest details of every kind, his constant vigilence for fully knowing about the latest discoveries of varied relevant materials relating to the present as well as the past subjects of his research, his thorough examination and deep critical analysis of the extant raw materials of history available to him, his honest and persistent efforts for the discovery of truth from unassailable sources and thereby continuously extending the bounds of knowledge. Once he decided to undertake any subject for his research study, Jadunath Sarkar got about in right earnest to collect all such possible materials as were then available to the public. He collected many relevant manuscripts and other worthwhile items of source material not only from various public libraries but also from private collections in India. Thus in the realm of history, Jadunath Sarkar was not only an excellent architect but a fruitful digger and a skillful stone dresser as well; all this he did with unique thoroughness and praiseworthy skill. The vast mass of all the, varied source materials, primary or secondary, printed or in manuscript, thus collected by him were then fully subjected to a minute detailed examination, a careful thorough study and a searching analysis for the requisite critical appraisal of the historical value of each of these items. Guided by the basic principles of the law of historical evidence, he carried out his analysis and final appraisal of each of these sources with a cool, calculated, relentless and severe firmness. Jadunath Sarkar fully understood the practical limitations of each source material and utilized the information given by it after critically appraising it, duly verifying it and considering its feasibility, and thereafter too only with great caution. He spared no pains to collect necessary information to verify and evaluate any relevant evidence. Whenever Jadunath Sarkar came across any important Persian manuscript which would necessarily be utilized by him extensively during the course of his historical studies and researches, he used to translate the whole of it into English with exact page or folio references of the manuscript and keep it handy for his future use. Similarly whenever he worked on any complicated or important period of history, he took detailed and exhaustive notes from all important sources. All relevant extracts from various Persian, Marathi or other sources were also then fully translated into English. Before actually writing works, Jadunath Sarkar used to prepare some other essential detailed datum and necessary outfit on the subject for his own help and guidance. Thus he was in the habit of making a detailed chronology of the entire period at the outset which was later duly revised, amended and enlarged as the study proceeded. Such a chronology helps the student most advantageously to clarify the movements of the person whose life is being studied. The gaps in the course of the story, as also in the material available, are easily detected. Personalities and their exploits can also be thereby seen in their proper perspective and correct focus. Jadunath Sarkar took equal care to correctly identify all personalities with whom he dealt in the course of his historical studies and researches, because the continual changes in the spoken names of the Muslim nobles 'with their promotion In rank, and the similarity in names of more than one person amongst the Rajputs and the Marathas, have been the cause of constant and major confusions in history. It was but natural for him to make an all-out effort to correctly identify all the places of historical importance with the help of modem maps, to find out their actual locations and to collect worthwhile, necessary topographical details about them, which could possibly be helpful in throwing some additional light on historical events connected with them. Quite often important historical events happen in some hitherto completely unknown place, and their obscure names quite often take various incorrect forms which provide a real challenge to a historian. Jadunath Sarkar spared no pains to correctly trace the movements of persons and armies, and also to describe at length the strategy and tactics in the various wars and battles, which are very informative and instructive to a student of military history as well. In his boyhood days, he happened to read De Jomini's Art of War, a text-book for military officers, which greatly impressed Jadunath Sarkar. Thence he studied with all due care and in minutest detail, the scenes of various historical battles and wrote down their accounts as if he were a war correspondent. Jadunath Sarkar made an extensive use of all extant materials which related to his subject or the period he was studying. Every scholar working thereafter in the same or related areas has hardly been able to find anything worthwhile that was not utilized by Jadunath Sarkar. Again, whenever any new and important source material came to light while he was writing about a subject, he would not hesitate in the least to definitely reject even entire chapters already written, completely ignoring his months of hard labour on them. He would sit down to rewrite them once again even though it would entail many more months of fresh uphill work. Finally, he was constantly revising his printed works by making requisite amendations and additions to them on the basis of such freshly discovered materials or other worthwhile research studies on the subject. Thus he was able to publish a revised edition of the first, the second and the third volume of his Fall of the Mughal Empire in April 1949, December 1950 and March 1952, respectively. He had also made similar emendations and additions in his own copy of the fourth volume by January 1956, for being incorporated in the revised edition whenever it would be printed. 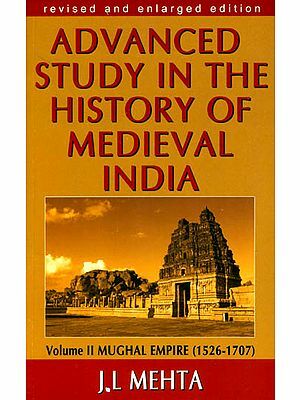 In each volume of Fall of the Mughal Empire Jadunath Sarkar has given detailed references to the source materials in the footnotes on which he has based his statements above. Again, in addition to the' Abbreviations' in his first three volumes, he has given at the end of the fourth volume a detailed list of all the 'Sources' utilized by him in this monumental work. All these should necessarily prove helpful to all later researchers on this period. The birth of the new India in which we live was preceded by the death of a political and social order under which the millions of this country had been nurtured for two centuries and a half, and which had done great things for them. The Mughal Empire, established in 1556, had united much of the Indian continent under one sceptre, given it a uniform civilization whose conquering light had penetrated beyond the bounds of that empire, and on the whole promoted the general happiness of the people in a degree unapproached except in the mythical past. It broke the isolation of the provinces and the barrier between India and the outer world, and thus took the first step necessary for the modernization of India and the growth of an Indian nationality in some distant future. The achievements of that empire, under the four great sovereigns, have been the worthy themes of historians of Akbar and Jahangir, Shah Jahan and Aurangzib. But the exhaustion of this civilising force with the consequent ruin of the country has hitherto repelled historians, probably because of the dismal nature of the subject which presents no spectacle calculated to elevate the human mind or warm the human bosom. And yet our immediate historic past, while it resembles a tragedy in its course, is no less potent than a true tragedy to purge the soul by exciting pity and horror. Nor is it wanting in the deepest instruction for the present. The headlong decay of the age-old Muslim rule in India and the utter failure of the last Hindu attempt at empire-building by the new- sprung Marathas are intimately linked together; and these must be studied with an accuracy of detail as to facts and a penetrating analysis as to causes, if we wish to find out the true solutions of the problems of modem India and to avoid the pitfalls of the past. The light of our fathers' experience is indispensably necessary for guiding the steps of those who would rule the destinies of our people in the present times. Happily such light is available in a profusion unthought of. The dissolution of the old order in India did not form a dark age during which the activity of the human mind ceased or the human brain and the human hand left no memorial of its working. On the contrary the eighteenth century in India is illumined for its historian by a host of witnesses of the most diverse races, creeds and tongues, and who recorded events as looked at from different points of view. We, no doubt, lack the detailed official annals such as those written for Akbar and his four immediate successors but the Indian actors in the scenes and the detached foreign observers alike have left a multitude of private memoirs and journals, which are in some respects of an even greater value than the former class of works though imperfect in their minuteness of dates and names. For this century masses of manuscript newsletters have been preserved, giving us the current news in the freshest form. The records of the Maratha government have at last been made available to students in their entirety. The state papers of the English and the French have been printed in our own lifetime; and of the still unprinted material in these languages, preserved in public libraries, the most helpful lists have been published - notably Hill's Home Miscellaneous and the Calendar of Persian Correspondence. The travel books, diaries and memoirs of the early Europeans in India form a vast literature, now mostly too rare to be obtained easily, but often giving priceless information on specific points and lighting up the economic and social condition of the age as no native work does. The materials are vast and varied, but this fact does not constitute the difficulty facing the historian of the period so much as the immense number of separate political bodies and centres of action created in the country by the dismemberment of an empire that had once embraced nearly the whole of India. A history of India in the eighteenth century which attempts to deal with every one of these provinces or states in all their actions would be like a bag of loose stones constantly knocking against one another and not like a single solid edifice. The present writer is here making the first attempt to synthesize the Persian, Marathi, English, French, Hindi, Rajasthani and Sanskrit sources, and to reconstruct the story of the fall of the Mughal Empire from the invasion of Nadir Shah in 1739 to the British conquest of Delhi and the assumption of the wardenship of the puppet padishah in 1803. Yet the nature of this writer's subject has enforced a strict limitation on him. The dispersion of interest could be avoided only by keeping the eye constantly fixed at the centre of the empire the emperor and his keepers- and rigidly eliminating every side issue that may divert the mind from the main theme. Thus provinces that had cut themselves adrift from the empire - Bengal and Bihar under the English after 1757, Malw1l and i Gujarat from 1741-50, the Pan jab after 1758, Oudh after 1761 and the. six Deccan subahs after 1748 - will not have their events narrated here except for the briefest references when needed to light up some problem or action of the central government. The Anglo-French struggle for an Indian empire will be totally omitted. Rajputana and Bundelkhand, though now owing little more allegiance to Delhi than those other lost provinces did, remained the cockpit of northern India, and the activities of those who held Delhi overflowed into these two regions till the end of the century. They will therefore be embraced in this survey. The internal affairs of the Maratha states are no concern of the historian of Delhi except where they serve as the motivating force of some Maratha activity in northern India and to that extent alone will they be noticed. By these limitations it is hoped to give a unity of structure and a connection of interest to this work. Where so many centres have been touched, a certain amount of repetition has been deliberately made, in order to refresh the distracted reader's memory, keep the main threads constantly before him, and clarify the issues. "It drives a broad pathway through a very tangled jungle .... It is apiece of work which badly needed doing, and it has been done with amazing thoroughness. The most valuable part of the book is the careful incorporation of Persian and Marathi unpublished material." The same woodcraft has been followed in this continuation of that work but the jungle is much thicker here. There was at least one common head of the Delhi empire up to 1738 (when Irvine's book ends), one centre of government in theory and almost always in practice. But after Nadir Shah's invasion, the dismemberment proceeded apace and many independent centres sprang up, whose interplay makes the history of the succeeding period extremely complicated. But the reader is most likely not to lose his way in this dense forest if the historian is constantly by his side to whisper, "Delhi is not far off". Such being the scope deliberately chosed for this work, the first volume has necessarily to treat its subject at a greater length than would be strictly proportionate to its period of time. It takes up the narrative at the departure of Nadir Shah and ends with the fall of Ahmad Shah, the last emperor of Delhi who showed any independence and by the time of whose death all the great men of the former generation had disappeared. The reign of his shadowy successor, Alamgir II (1754-59), and the rule of his wazir, Ghaziuddin Imad-ul-mulk, will receive a very brief treatment because the historical stage of Delhi is now dominated by Ahmad Shah Abdali, whose career leading up to his crowning victory at Panipat (1761) deserves to be studied in greater detail from the wealth of original material not yet used by any writer. Then follows a period of dull chaotic ferment for some twelve years with little to detain the historian long. A new scene opens with the rise of Mahadji Sindnia who bestrides the plains of northern India like a colossus for two decades. This heroic figure it is my intention to study at length from the records in various languages in an almost overwhelming mass, which I have been able to collect. From Mahadji Sindhia’s death (1794) to the British conquest of Delhi, the tale is well-known. I shall tell it merely to round my work off. This book attempts to tell the full story of the actual fall of the Muslim empire which the Timurid prince Babar had founded in India in 1526. The decline of that empire had, however, commenced nearly a century before the year 1738, from which this book starts. The first unperceived origin and the gradual spread of the moral decay has been studied by me in earlier works, to which the reader must turn if he wishes to learn how step by step the poison worked in the body politic of the Delhi empire. Outwardly the empire reached its zenith under Shah Jahan (r. 1628- 1658) but in this very reign its decline commenced. My History of Aurangzib, in five volumes, starts with a detailed study of that prince's campaigns as his follower's agent in the Deccan, Balkh and Qandahar, followed by his administrative and martial activities as an exceptionally capable viceroy of the Deccan, other incidents, and the illness (in 1657) which cost Shah Jahan his throne. The earlier history of the Sultanates of Bijapur and Golkonda and the rise of the Maratha national hero Shivaji are sketched here. The second volume describes the war of succession among Shah Jahan's sons. The third volume of History of Aurangzib confines itself to north India during the first half of Aurangzib's reign, which he passed there in comparative peace except for the long wars with the Afghan frontier tribes and with the Raj puts. It describes his family and ministers, the state policy and moral regulations, his religious bigotry and the reaction it provoked among the Rajputs and the Sikhs. The basic ideas of the Islamic State are critically analysed and their practical effect illustrated. Tod's Annals and Antiquities of Rajas than is corrected at many points. The fourth volume deals only with southern India from 1658 to 1689 but it also looks back to 1644, the roots of Mar at ha history. It tells the full story of the last years and the extinction of the kingdoms of Bijapur and Golkonda, and the reigns of Shivaji and Shambhuji as reconstructed from many original sources. The last eighteen years of the emperor's life - 1689-1707 - with their strenuous exertion and hopeless suffering are the theme of the fifth volume. This book also treats of the history of the Madras coast districts and the Mysore plateau, the seige of Jinji - 'the eastern Troy', the successful Maratha national struggle for independence, the European piracy on the eastern waters, the clash between the Mughal government and the English traders, the thirty years' war in Rajputana, There is a general history of several provinces during this long reign with a study of the causes of the empire's decline. But the social history of the country is not studied, except for brief references, in these volumes. A separate volume entitled Mughal Administration discusses the structure of the imperial government, the sovereign's power and functions (as pope and Holy Roman emperor) combined), the departmental procedure, the provincial administration, taxation, Muslim law and justice, the status of the aristocracy, the state industries and the official correspondence rules. The book ends with a review of Muslim rule in India and its achievements and failures. The personal character of Aurangzib is illustrated in Anecdotes of Aurangzib , translated from a Persian manuscript that was traced and edited by me. It gives his pithy sayings, cutting remarks, the principles of government, the treatment his sons and officers - Hindus and Shias - received, and his last will and testament It is a picture of his administration in its actual working. Shivaji, who dominated the political stage of south India during half of Aurangzib's reign, is portrayed in full detail in my Shivaji and His Times - now in the fourth edition. It is supplemented by a volume of documents and studies on Maratha history, entitled House of Shivaji. These two books complete the history of India by fully treating the south Indian affairs, which my History of Aurangzib had somewhat neglected in concentrating on. In House of Shivaji will be found the most correct account of that great king's historic interview with the Mughal emperor, the life of his father Shahji, the reign of his son Shambhuji, and the adventures of Prince Akbar, the rebel son of Aurangzib. The evolution of Indian culture and society is surveyed in broad outlines in my India through the Ages which reveals the contribution of the Muslim age to the joint product as well as our legacies from the Aryans, the Buddhists and the British. The cultural aspects are also illustrated by the chips from my Mughal workshop which I have gathered together in a volume of eighteen chapters, called Studies in Aurangzib's Reign. It treats of this emperor's daily routine, his sons and the poetess- daughter Zeb-un-nisa, his saintly elder sister Jahanara - 'the Indian Antigone', the two contemporary Hindu historians of the reign who wrote in Persian, the Portuguese pirates of' Chittagong, and the industries and commerce of the empire. After the death of Aurangzib (1707) the narrative is continued in William Irvine's Later Mughals. I corrected and annotated his manuscript- which ends at 1737 - and published it in two volumes in 1922 after adding three chapters that cover Nadir Shah's invasion of India, 1738- 39. Irvine had made a masterly synthesis of all sources in the Oriental and European languages known to him, but he could not use a new source of information of the highest value that begins to light up Mughal history from 1720 onwards. This has become our primary authority for the second half of that century: I mean the state papers and letters in Marathi. I have woven information from this source into the text of Irvine's narrative, which was restricted to Persian and English sources. Fall of the Mughal Empire begins where Irvine's book ends: early in 1739. Here, necessarily, the Persian and Marathi sources - mostly unprinted - form the main support of the historian. The first volume of the work deals with the reigns of Mu ham mad Shah and Ahmad Shah and . ends at 1754 when the last hereditary emperor was murdered. The second volume is devoted to the classic contest between the Afghans and the Marathas that culminated in the battle of Panipat (1761), the rise and line of the rat kingdom, and the disintegration of the political order in Rajputana, Malwa and the Panjab. The third volume tells the sickening tale of the struggle for the control of the puppet emperor by rival Muslim les and that ended with the installation of Mahadji Sindhia as the viceregent of the empire, December 1784. The fourth volume tells the of Mahadji Sindhia's hard-won triumphs over the Rajputs and his rival Holkar, the break-up of the Peshwa's empire, and the rise of the political meteor, Jaswant Rao Holkar. It ends with the establishment of British paramountcy in 1803. This volume covers eighteen eventful years in the history of India, of which the dominating theme is the great Afghan- Maratha contest for the lordship of Delhi, followed by the abrupt rise and the still more abrupt fall of the rat kingdom of Bharatpur within the space of a decade only. This period witnessed the deposition and blinding of one emperor, the murder of another, the twelve years' banishment from the capital and from power - of a third, and the ten months' reign of yet another crowned puppet in Delhi. Horror is piled upon horror almost throughout the epoch but at its end the worst is over, and we begin to emerge into light. The Sikhs have now established their rule over much of the Panjab and given to the people of that province internal security and the promotion of agriculture in a degree unknown for the past sixty years. At the opposite corner of India, in Bengal, Bihar and Oudh up to Allahabad, British peace has been established, and trade, industry and tillage are on the threshold of an unprecedented revival after the unbroken anarchy of one full generation and the apalling natural calamities. Soon the indigenous culture which had been quenched in blood in the capital cities of the empire was to revive and Indo-Persian historical literature was to take a new birth under alien patronage at Allahabad and Benares, Patna and Calcutta. When Shah Alam II rode into the capital of his fathers on 6th January 1772- the point at which this volume ends- we are within three months of the beginning of the governorship of Warren Hastings, the creator of British India. The many dark corners in the history of this period have been lighted up by the profusion of Marathi records and several contemporary Persian works here used for the first time. Material in the European languages, English and French, the work of actual actors in the Indian scene, here grows increasingly important. Just after the close of this volume these take the first place among our sources of information while the recently printed Marathi records come up close behind. The problems of the Delhi empire now (1772) change their character and the historian stands at the dawn-a misty dawn, I admit-of a new age, the noontide splendour of which was to be seen in the nineteenth century. Orient Longman have over the last two decades acquired the re- publication rights of many major works of Jadunath Sarkar. These have already been reprinted several times under our imprint We now plan to issue them in a standard format, with certain editorial changes and additional features which, we hope, will enhance the utility of these volumes to students of history. We are grateful to Dr Raghubir Sinh of Sitamau, a close associate of Jadunath Sarkar, for having written the foreword to Fall of the Mughal Empire. We also thank Dr Nisith Ranjan Ray, Director, Institute of Historical Studies, Calcutta, for his help in preparing the, further reading list and in completing the list of Jadunath Sarkar's works, both of which appear as appendices. This volume carries the story of the Delhi monarchy from the entrance of Shah Alam II into his capital in 1772, through seventeen years of his rule, to the bloody tragedy of 1778 which turned the Mughal monarch into a mere shadow and transferred his government to a perpetual vicar, till another and still bloodier tragedy came seventy years later which struck out the very name of his dynasty from the pages of Time. Among the phantoms of the past that crowd the stage of his volume, the dominating figure is that of Mahadji Sindhia, as Ahmad Shah Abdali's was in the volume before it. The final assertion of Mahadji's supremacy over all the members of the empire took place two years beyond the close of the present volume, but the importance of that political development and the vast and diversified mass of materials available for its study have prevented me from continuing the story to that point. In fact, this third volume has taken twice the time of its immediate predecessor to write, because of the immensity, variety and confused character of the historical sources on which it is based. The dates of thousands of laconic Marathi despatches had to be ascertained, their obscurities cleared, and the textual reading and arrangement of the Persian manuscript sources had to be corrected, before a single page of my narrative could be composed. To give two examples: the Persian newsletters collected by Claude Martin and now preserved in the British Museum in two volumes running to 1500 manuscript pages (Or. 25020 and 25021), do not except in the rarest cases give the year, and hence the owner has bound them by placing all the sheets of a particular month for these nine years lumped together in one place, in the order of the days of the month only! It is only after ploughing my way through these huge collections of reports and concentrating light on their contents from the three languages, Marathi, Persian and English, that I have been able to date and interpret this class of sources correctly. Again, the invaluable memoirs of Faqir Khair-ud-din (the Persian secretary of the Anderson brothers, British Residents with Sindhia) run to a thousand pages of foolscap folio size in my manuscript. But this is a copy made from the Khuda Bakhsh [Oriental Public Library, Patna] manuscript, which itself was transcribed from a defective and wrongly arranged original, without its scribe or my scribe noticing these defects. It took me two months of work at the Royal Asiatic Society of Bengal to collate my copy with the Society's manuscript, in which too, several folios have been placed out of order at the time of binding! During the same period the despatches of the British Residents, James Anderson, William Kirkpatrick and William Palmer from the remnant of the old Poona Residency archives, supplemented from the Imperial Records then housed in Calcutta, had to be collected, edited and printed by me for the Government of Bombay, under the title of Mahadji Sindhia and North Indian Affairs, 1785-1794. As a result of it, the reader can now see some light in this dense and tangled jungle of historical materials, and future workers in this field will, it is hoped, be saved from much distraction and loss of time by the minute references given by me for every personality and incident. A certain amount of repetition will be noticed in the narrative, but it has been deliberately made in order to keep the reader's eye fixed on the main currents of this history, amidst the distracting rapidity and confusion of political changes. Unfortunately for the historian, the French captains have left no accounts of their romantic Indian careers. The very short memoir of Rene Madec touch only the fringe of the subject and end as early as 1776. De Boigne lived for many years after returning from India, but from the cosy chair of his palace in Chambery he only talked to Grant Duff and Grant Duff has not played the Boswell to the veteran. Perron was a weaver's son who hated to touch a pen. Their Indian secretaries have left behind them letters only-mere business papers and money accounts-in Persian but no regular history or even journal, like the priceless memoirs of Anderson's munshee Faqir Khair-ud-din, What would we not have paid for a volume of Indian recollections by De Boigne like the Journal du Voyage du Bengale a Delhy (1774-1776) written by the cultured aristrocrat Comte de Modave, the nature of which can be judged from the portion translated by me in Bengal Past and Present, 1936. In the second volume the reader supped full of horrors; he saw one emperor murdered, another deposed and blinded, and a third driven into exile and poverty for his very life. In the present volume no padishah dies a violent death, but the only emperor who fills the throne throughout meets with a fate which makes him cry for death by the assassin's hand as a welcome relief. But with the close of this volume the succession of palace tragedies and camp assassinations also ends. Mahadji Sindhia's regency opened a period of peace and comparative prosperity for Delhi city and the districts that still acknowledged the authority of the Crown; military reorganisation of a new and efficient type was carried out and economic development fostered in the present United Provinces by French genius and industry. Except for domestic feuds, Malwa-and in a lesser degree Rajputana-began to know peace, till we reach the disintegration of Sindhia's government under Daulat Rao at the end of the eighteenth century. These will form the theme of the concluding volume and the author is cheered by the prospect of bidding farewell to unrelieved bloodshed and treachery and making his acquaintance with revenue and administration, agriculture and industry, social changes and cultural growth in a part of India not yet under British care. Orient Longman have over the last two decades acquired the re-publication rights of many major works of Jadunath Sarkar. These have already been reprinted several times under our imprint. We now plan to issue them in a standard format, with certain editorial changes and additional features which, we hope, will enhance the utility of these volumes to students of history. We are grateful to Dr Raghubir Sinh of Sitamau, a close associate of Jadunath Sarkar, for having written the foreword to Fall of the Mughal Empire. We also thank Dr Nisith Ranjan Ray, Director, Institute of Historical Studies, Calcutta, for his help in preparing the further reading list and in completing the list of Jadunath Sarkarsork’s work, both of which appear as appendices. The study of the Mughal empire which I began with my India of Aurangzib: Statistics, Topography and Roads (printed in 1901), has come to its end with the extinction of that empire which is the subject matter of the present volume. The events of nearly half the reign of Shah Jahan and the whole of Aurangzib's are covered in my History of Aurangzib in five volumes, with a supplementary work Shivaji and His Times. Then follows W. Irvine's Later Mughals (1707-1738) in two volumes edited and continued by me, and lastly this Fall of the Mughal Empire (1738-1803) in four volumes. Such a long survey, always on the basis of original sources in many languages, could be completed only by the rigid exclusion of those provinces of India which had broken away from the Mughal empire, and also by ignoring events not directly related to the fate of that empire, such as the Anglo- French rivalry for the dominion of India, and the dynastic struggles in the provinces that had renounced the suzerainty of Delhi. A more serious defect is that the social and economic history of this long stretch of time has been crowded out of the present series, though I have made many short excursions into that field in my minor works and essays. During the half century that has passed since I started my investi- gation, a marvellous expansion of our available sources has taken place. Nearly the whole of the State or family papers and other valuable records in the Marathi language have been printed; the records of the Central Government of India and the National Archives of France have at last been thrown unreservedly open to scholars, and both of them have begun valuable publication work. The Bombay Government's achievement has been most creditable, as the cream of their Marathi records and all the English Residency correspondence have been made available in print. Even Rajput jealousy has been disarmed, and the priceless Jaipur records of the Mughal times are now allowed to be read. Every Maratha State now considers it a duty to publish its historical papers under careful editorship. Advances in cheap photography (such as rotary bromide prints and Photostats, as well as microfilming) have brought the most jealously guarded documents of European libraries within the reach of poor private scholars in India-notably under M.K. Raghubir Sinh, D.Litt., of Sitamau, Central India-and libraries containing such replicas are being built up in India, which was beyond the dream of our workers in 1901. Persistent search for half a century, mostly by our own people, has led to the discovery of many important historical manuscripts unknown before, so that Elliot and Dowson has ceased to be our sole stay. The India Government's Survey Department has given in- vaiuable-but little utilised-aid to Indian historical study, by .the publication of accurate and detailed maps of every part of India . Above all, there is a vigorous awakening among our reading public and university students, as to the charm and practical usefulness of original research into our country's storied past. This will lend solid support to my more fortunate successor in the next half century. Orient Longman have over the last two decades acquired the re- publication rights of many major works of Jadunath Sarkar. These have already been reprinted several times under our imprint. We now plan to issue them in a standard format, with certain editorial changes and additional features which, we hope, will enhance the utility of these volumes to students of history. We remain grateful to Dr Raghubir Sinh of Sitamau, a close associate of Jadunath Sarkar, for having written the foreword to Fall of the Mughal Empire. Before he passed away in February 1991, Dr Sinh aw two volumes of this new edition in print. We also thank Dr Nisith Ranjan Ray, Director, Institute of Historical studies, Calcutta, for his help in preparing the further reading list and in completing the list of Jadunath Sarkar's works, both of which appear as appendices.